Many thanks to Richard Clarke for hosting our May 18th meeting! A good time was had by all twenty VPC members (including two newcomers -- Linda and Jean) who were in attendance to hear about our meeting theme --- "First and Last" (first fountain pens and most recent fountain pen acquisitions). 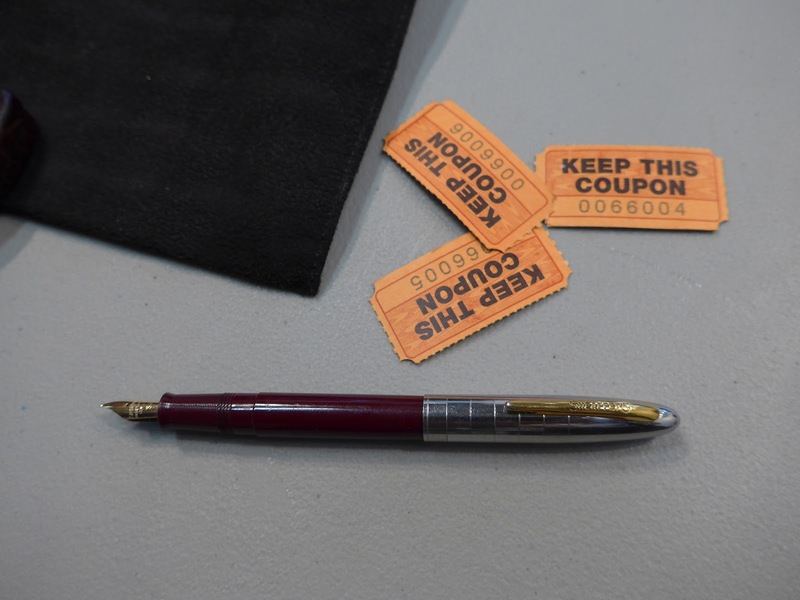 Thank you also to Tim for his donation of two PCA (Pen Collectors of America) magazines for our door prize draws (won by Ricardo, and Alejandra's daughter - Natasha). Last but not least, thanks to Brian J. for his generosity in donating a large stack of "Pen World" and "Stylus" magazines, which were given out to interested members. 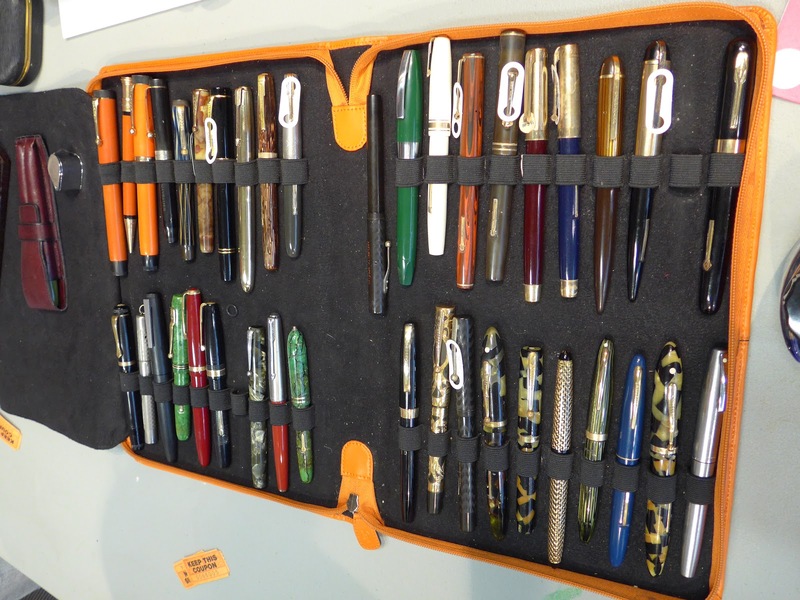 Merci beaucoup, gentlemen! 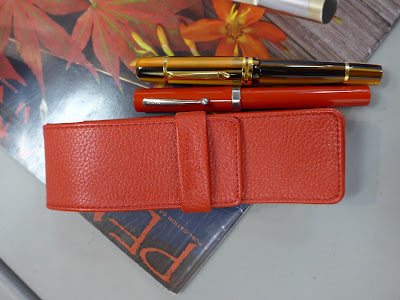 Above: Marzieh's first fountain pen---a classic vintage Sheaffer Balance---and lovely red Lamy pen case. Marzieh brought some recent acquisitions in her pen roll---a Lamy Safari in "Dark Lilac" (Safari's colour for 2016) and Faber-Castell 'WritINK' fountain pen. 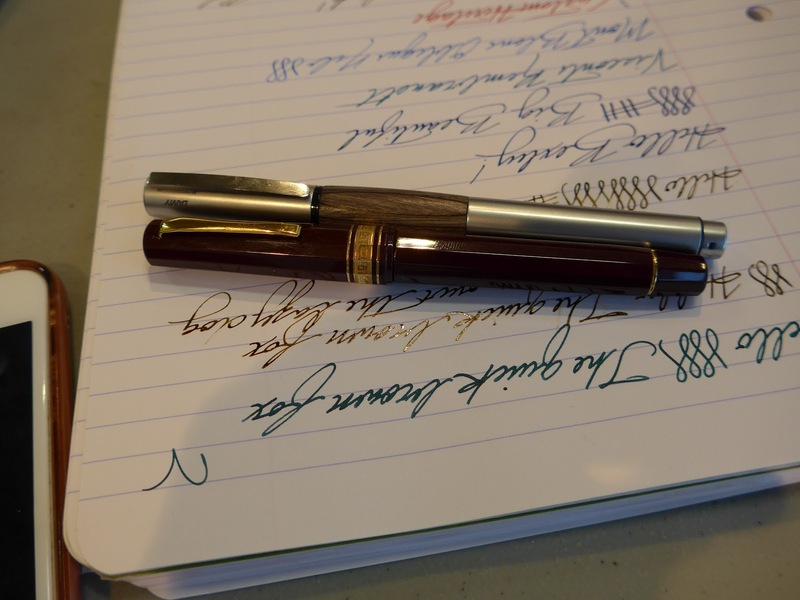 New VPC member Linda brought her most recent acquisition---a Sailor Chalana. It's hard to tell from the photo, but this is a very small (and slender) fountain pen. It is no lightweight in the writing category, though, as it sports one of Sailor's high quality nibs. 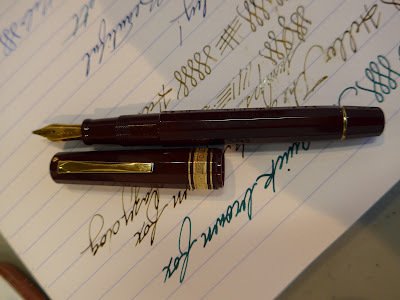 Linda told us that her first fountain pen was an Esterbrook from the "J" series. 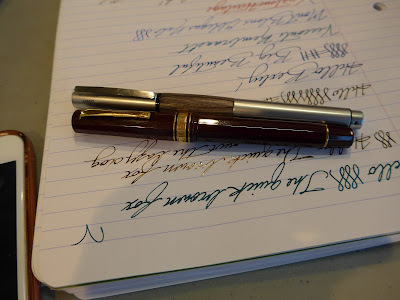 June brought both her first fountain pen (a Lamy Accent with Karelia wood grip--a gift from Bart) and her most recent acquisition---an old-style faceted OMAS purchased at the 2017 Los Angeles Pen Show. 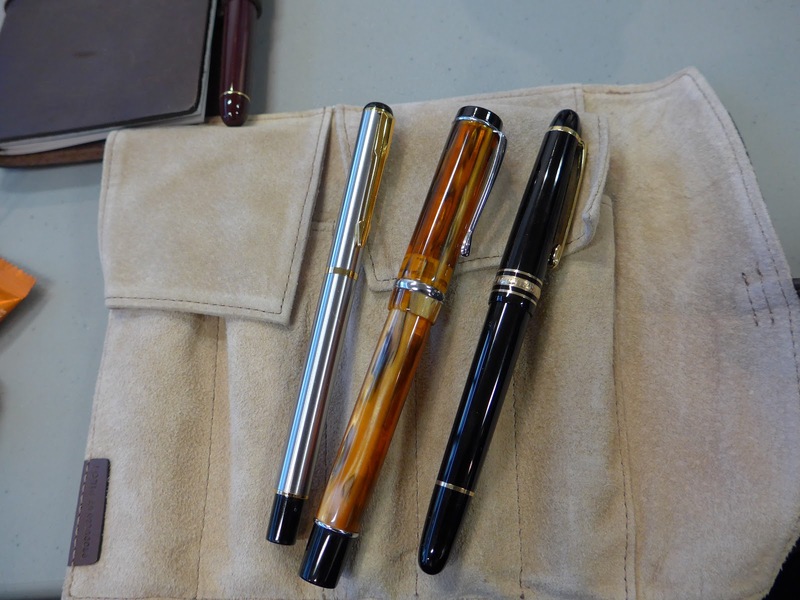 Bart forgot to bring his first and last pens, but showed us some photos of them---a Kaweco Sport (his first fountain pen) and a Visconti 'Millionaire' LE--Limited Edition (his most recent FP purchase). Jerred brought in some new acquisitions, including an attractive vintage set (possibly a Sonnenblick), as well as (from bottom of photo) fountain pens by Christian Dior, Platinum ('Standard' model) and Delta (unknown model). 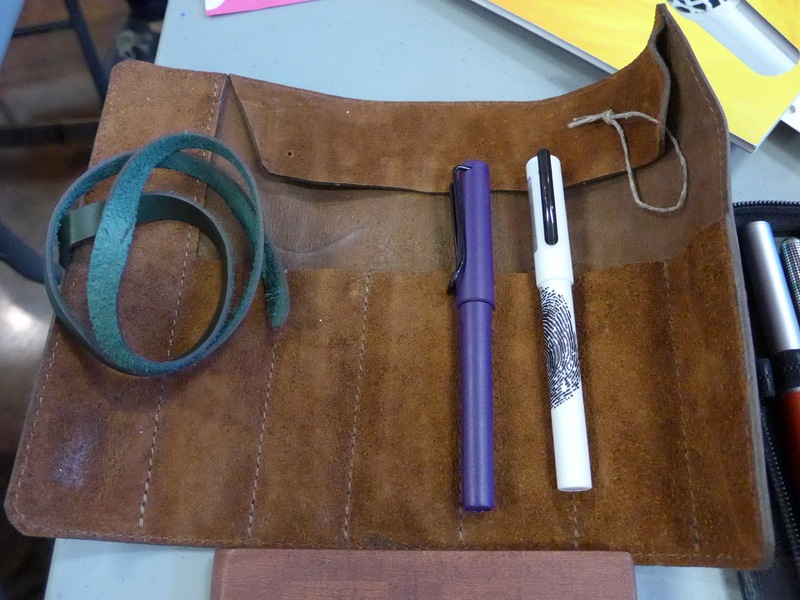 Jerred's first fountain pen (not pictured) was an inexpensive Chinese pen. Justin's first FP was the black Montblanc 146 Chopin pictured on the far right of the photo above, while his newest fountain pens were a Conklin 'Duragraph' in the Amber colour and an all-metal pen with a Fude nib. The Fude nib is bent upwards (like a ski tip) allowing for some interesting line variation. 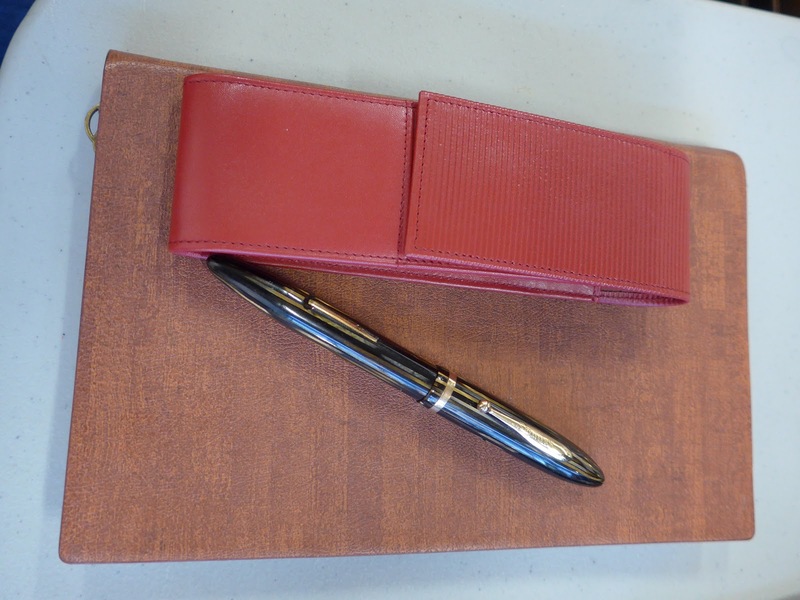 From top of photo: Peter's Parker Jotter (a ballpoint! 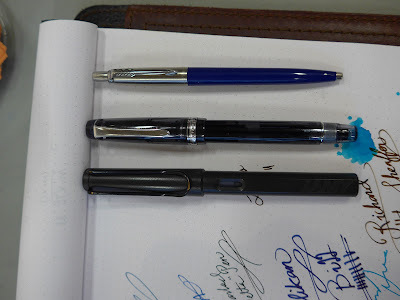 ), Pilot '92' (most recent purchase), and black Lamy 'Safari' (first fountain pen). 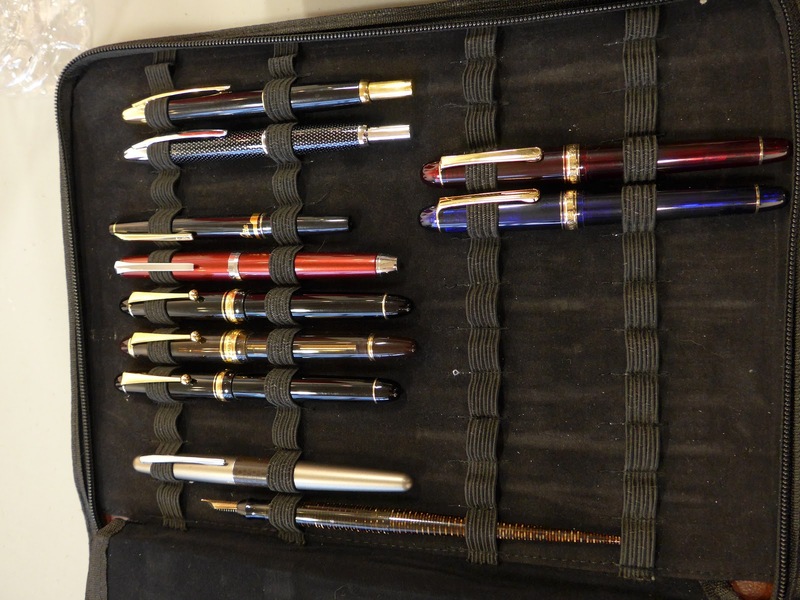 Mark's 40-pen case, filled with some great vintage fountain pens. 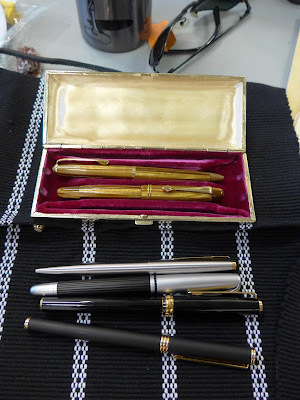 Mark's first fountain pen was a Sheaffer Cartridge pen (aka Sheaffer "School Pen") and his latest fountain pen acquisition was a vintage Montblanc '22'. 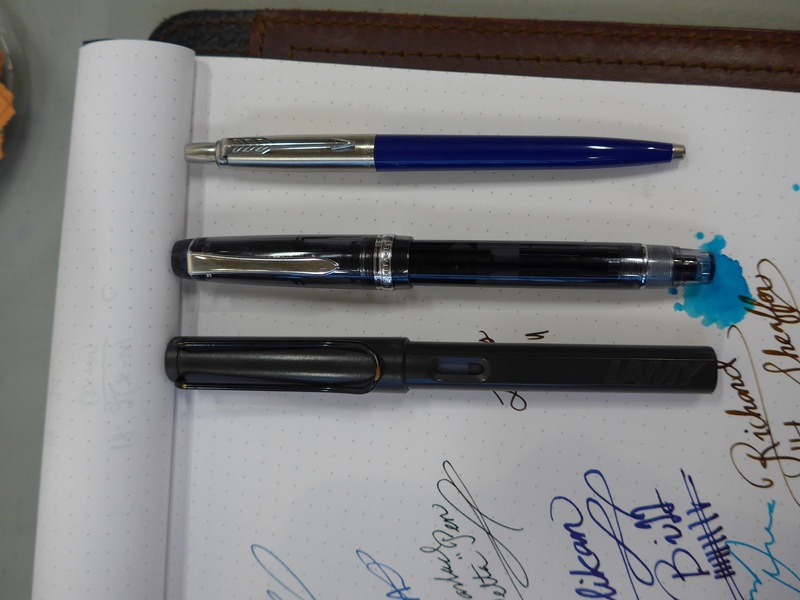 I didn't snap a photo of them, but Stuart's first fountain pen was a Montblanc 146 and his most recent purchase was a Waterman C/F. 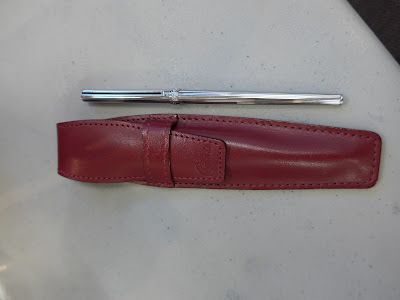 I did, however, take a photo of his Sheaffer 'Tip-Dip Crafstman' (pictured above), which has an interesting filling mechanism. The 'Tip-Dip' was basically a Sheaffer fountain pen that used the Touchdown-Filling mechanism, but whose feed had a special opening (on its underside) that allowed ink to flow directly into the sac, making filling the pen with bottled ink less messy. 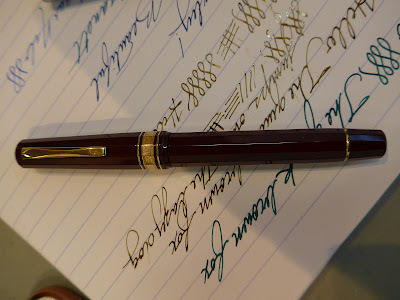 There's a good article about them on Penhero.com here . Finally, my own first and last pens---my trusty red Sheaffer 'NoNonsense' (purchased in the mid-1970s at a Woolworth's store) and my latest acquisition--another gorgeous Bexley Poseidon Magnum in a non-production colour (actually this one is a "Magnum II" model, with an American-made piston-filling system; the original Magnum--which I also own---is a cartridge-converter-filling pen). Red pen case by Campo Marzio. I'll post a few more photos of my new Bexley later. 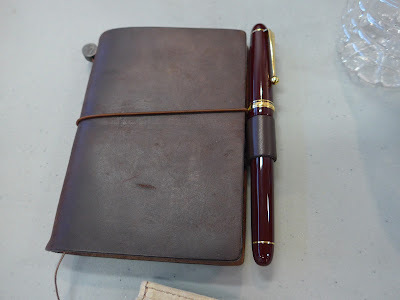 Also, Ricardo sent me quite a few photos he snapped during our May meeting, so I'll post them here on our site as well.